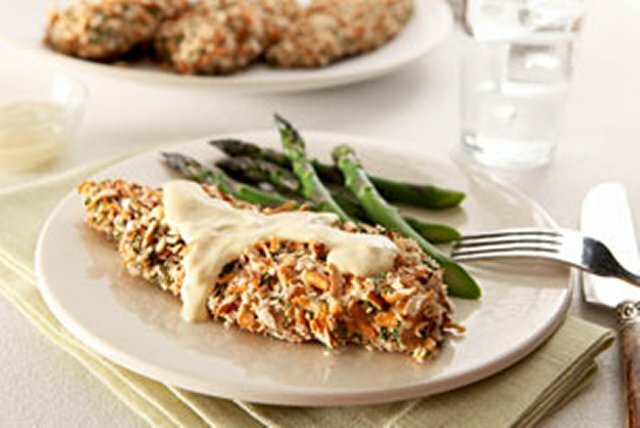 Boneless skinless chicken breasts are dipped in a mixture of mustard and ranch dressing, coated in crushed pretzels and baked to crispy perfection. Mix 3 Tbsp. mustard and 1 Tbsp. dressing in shallow dish. Mix pretzel crumbs, onion, parsley and pepper in separate shallow dish. Dip chicken, 1 breast at a time, in mustard mixture, then in pretzel mixture, turning to evenly coat both sides of each breast with each mixture. Place on baking sheet sprayed with cooking spray. Bake 25 min. or until chicken is done (165ºF). Mix remaining mustard and dressing; serve spooned over chicken.